I’ve been into diagramming out my laser equipment lately as it makes more sense to me when it’s in a schematic, I still have some work to do one the TEA N2 laser, but I spent some time today working on the Meditec Argon Ion laser that I have. The schematic and pictures below are of the two modules/assemblies which make up the starter. Here’s the basic process of how I believe this works, subject to modification. Feel free to comment! 1. 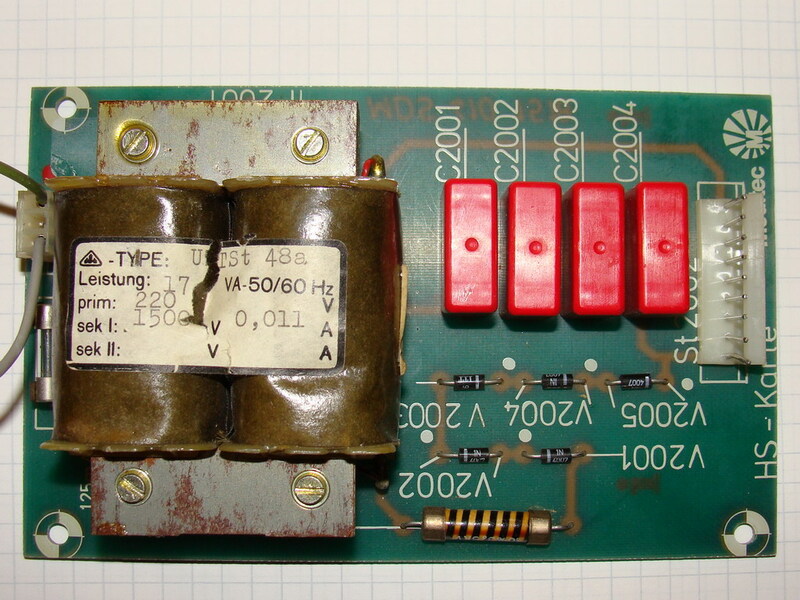 The transformer’s 1500V output is current limited by the resistor and half-wave rectified by the chain of 5 diodes. 2. The 1n4007 diodes are a very generic type rated at 1amp at 1,000 Volts. 5 In series provides a rating of 5kV. Since this is a half-wave capacitor input load the circuit should output a peak of 1500*1.41 (2115 Volts DC) and an average voltage of 1500*0.90 (1350 Volts DC) the diodes have a large safety margin. 3. 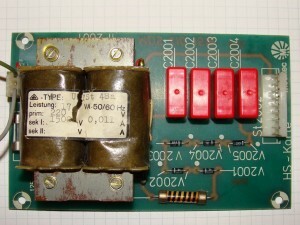 The capacitors are charged from this current limited and rectified power source. 4. At first the voltage is pulled down by the current demands of charging the capacitors. 5. As the capacitors charge, their current demand drops, allowing the voltage in the circuit rise. 6. As the voltage on the circuit reaches the breakdown voltage of the argon gas in the laser tube, the capacitors are discharged down the length of the bore, creating a conductive plasma which the low voltage/high current source from the power supply will flow through. 7. 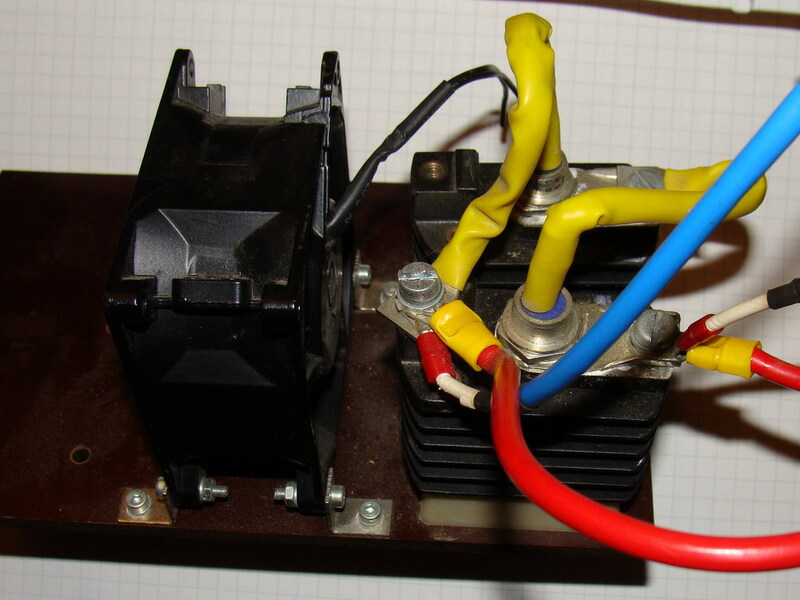 Once the laser is started, the starter circuit is disabled. 8. The discharge will be sustained until power from the power supply is removed. Starter board: The 9 pin connector on the start board actually only uses the 2 outermost pins for the HV start energy. The connector that plugs in there and leads to the blocking diodes has 2 white/blue wires. Blocking Diodes: The white and blue wires come from the start module. The heat sinks have black plastic mounting points on the top of them. I was looking at this in low light and was a bit confused until I actually noticed the rivets on either side of the mounting point and realized.. ah!